Last Tuesday, I made a trip over to North Carolina to fish with Zakk Royce on Lake Gaston. 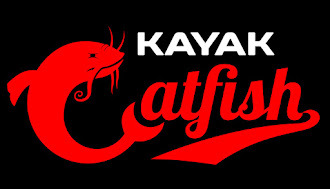 If you aren't familiar with Zakk, he set the catfishing world on fire a couple years ago when he broke the North Carolina blue catfish state record twice in 24 hours. I have been following him ever since and have been fascinated by his method of targeting catfish using planer boards. This trip was one that I had been looking forward to taking for a long time. While many people take a guided trip with the hopes of catching fish, my goal was to simply learn. Any fish caught would just be a bonus. I wanted to spend the day picking Zakk's brain to learn how, where, and what depth he locates fish at during various times throughout the year, where and how he catches bait at different times of the year, how weather/current/moon/water temps/water color affects his fishing, what speed he travels while trolling and why, etc. Thankfully, Zakk was more than willing to answer any question I had and was very helpful in teaching me his methods. The fish were pretty cooperative too. I lost count but we ended up catching somewhere between 15 and 20 blue cats throughout the day. No doubt we would have caught even more if the wind hadn't kicked up to 15+mph in the afternoon as a front moved through. High winds make fishing tough no matter what platform you fish from. By far the most interesting catch of the day was the fish pictured above. 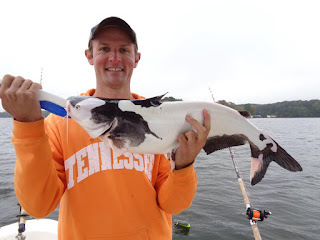 This is a piebald catfish. Piebald simply means spotted or blotched with black and white. This is caused by a genetic mutation. In addition to looking very cool, it is very rare to catch a fish with this coloration. Zakk said he only knew of one other person who had caught one on Lake Gaston. After contacting his friend Ian Picket who had caught the fish and comparing pictures, we realized this was the same fish. You can tell from the unique markings. Ian had caught and released this fish back in August approximately 12 miles from where we caught it again. All in all, it was an awesome trip. Zakk taught me a lot of things that I will be able to apply to my home waters and I was able to catch a bunch of fish while there too. It is also really cool to see the positive effects of CPR (catch, photo, release). Through the years, I have had many people from the catch and kill crowd argue with me claiming that CPR doesn't work. It clearly does work and this fish is further proof of that. Thank you to Zakk Royce for sharing your knowledge with me and thank you to Ian Picket for releasing this fish so that I was able to catch it again. This fish is still swimming in Lake Gaston for the next person to enjoy.